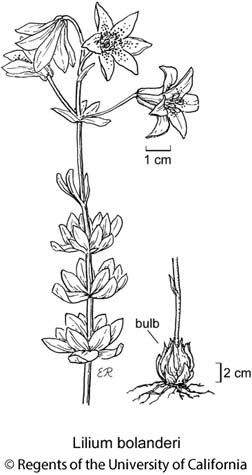 Habit: Plant < 1.1 m, glaucous; bulb erect, +- ovoid, scales unsegmented, longest 3--6 cm. Leaf: in 2--6 whorls, +- ascending, often cupping stem, 1.8--7 cm, generally +- obovate or +- oblanceolate, generally distinctly glaucous; margin generally wavy. Inflorescence: flowers 1--9, nodding to spreading. Flower: narrowly bell-shaped, not fragrant; perianth parts 3--4.7 cm, +- recurved in distal 20--40%, red or magenta (salmon, pale yellow), adaxially basal 30--50% often +- yellow; stamens exceeded by to held at same level as perianth, filaments +- parallel, anthers 3--8 mm, +- red or magenta, pollen red-brown, orange, or yellow; pistil 2--3.5 cm. Fruit: 2--4 cm. Ecology: Serpentine soil in chaparral, conifer forest, generally with Xerophyllum; Elevation: 150--1500 m. Bioregional Distribution: KR; Distribution Outside California: southwestern Oregon. Flowering Time: Jun--Aug Note: Hybridizes with Lilium pardalinum, Lilium washingtonianum subsp. purpurascens, Lilium rubescens. Synonyms: Lilium howellii I.M. Johnst. Citation for this treatment: Mark W. Skinner 2012, Lilium bolanderi, in Jepson Flora Project (eds.) Jepson eFlora, http://ucjeps.berkeley.edu/eflora/eflora_display.php?tid=30926, accessed on April 19, 2019.